The car was created on the basis of the car in 2014 m. A total of 53 such cars are expected at a price of 190,000 pounds. "The best" Defender has an improved motor. In it appeared new camshafts, cylinder heads, as well as enlarged nozzles. The car has a newest exhaust path, an intake system, a sports type catalyst and an exhaust with a bypass valve to sound "real V8." The main idea of this project is a rethinking of the Defender concept for performance and comfort while preserving the entire all-road potential of the car. 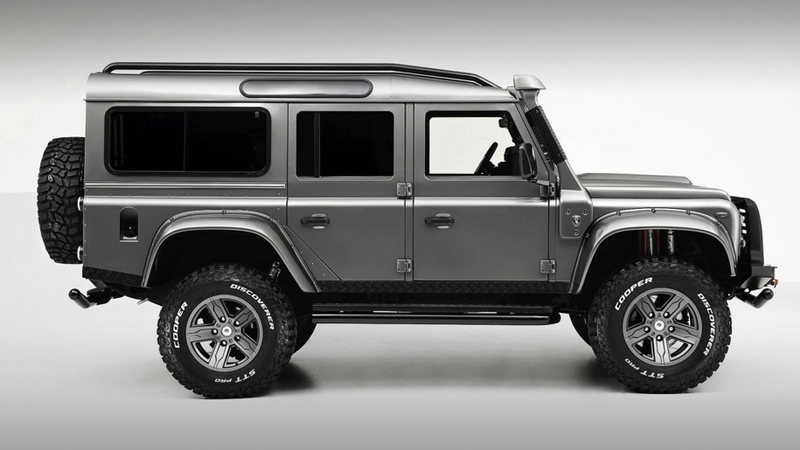 Defender sets in motion "atmospheric" Rover V8 4.7 l (was 4.5 l) or its compressor variation. In the first case, the power is 282 hp. and 439 Nm, in the second - 475 hp. and 649 Nm. The engines operate with a 6-speed automatic transmission. Inside such a Land Rover Defender, you can install everything the client wants. The finish can be with leather, aluminum, carbon fiber and natural wood.